This is a review of Pilfood’s Complex oral supplement. Pilfood claims that their product can increase the vibrance of your hair, adding volume, length, and elasticity. Pilfood also claims that their complex supplement can aid in strengthening nails, as well as improving your overall complexion and smoothness of skin. Continue reading this article to find out if this is the right product for your skin, nail, and hair needs. After reviewing the recommended dosage provided by Pilfood’s website, it is suggested that adults take between 2 and 3 pills daily, with food. Pilfood recommends consistent usage for between 6 and 8 weeks before results can be seen. This product is not recommended for children or individuals under the age of 18. After carefully reviewing the ingredients listed, it seems that Pilfood contains strong enough levels of several of its active compounds to be effective in the human body. Pilfood also utilizes several substances that are backed by years of scientific study, and are proven to have the effects advertised. No negative side effects have occurred, according to the company’s website. It is suggested that if you are a nursing mother, pregnant with child, or currently taking medications, you should seek out medical advice before starting Pilfood’s Complex supplement. Pilfood also states that without a balanced lifestyle and moderate diet, this supplement isn’t nearly as effective. One bottle of Pilfood’s Complex supplement costs $36.96 through a secondary seller, and contains 60 pills, enough for between 20-30 days of use. No reviews could be found on the company’s site to verify the effectiveness of this supplement. Pilfood is not a direct retailer of their supplement, so no guarantee is offered. Upon closer examination, no subscription programs or discounts are offered from Pilfood. Any returns or exchanges will have to be processed through the individual retailer, and customers will be subject to their specific rules and regulations. 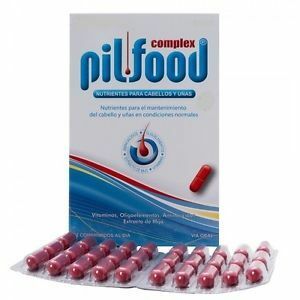 Pilfood’s Complex supplement seems to be a fairly quality product that we can heartily recommend. It contains more than adequate levels of the active ingredients to see a real, noticeable impact on the human body, specifically the areas targeted (hair, skin, and nails). Furthermore, it is sold at an extremely reasonable price considering that it contains almost double the amounts of active ingredients found in several of Pilfood’s competitors. We do, however, take issue with a few things, the first of which being a complete lack of reviews or testimonials, both on the company’s site and on secondary seller sites. Also of some concern is the difficulty in contacting Pilfood for any sort of additional product info, as they don’t list any offices outside of their country of origin (Spain) that could handle international purchases. John Brownstone	reviewed Pilfood's Complex	on July 5th	 and gave it a rating of 2.5.